EUR/USD. "The "pigeon" rhetoric of ECB Head Mario Draghi during his speech on Thursday January 24 for some time knocked over the pair to the lower border of the medium-term side channel 1.1300-1.1500. However, the bears' joy turned out to be short - lived: having visited the level of 1.1289, the pair turned around and returned to the channel center line, at the 1.1400 zone, by Friday evening. Which is understandable: on closer examination, Draghi didn't say anything special. Noting some strengthening of the labor market and reduction of risks for the Eurozone economy, the head of the ECB said that there was no point in holding a new QE now. At the same time, the time frame for the first raising of the interest rate on the euro remains unchanged. Cryptocurrencies. The lull in this market continues, capitalization is not growing, and the major coins rates are showing a sideways trend. Neither criticism from JP Morgan analysts, nor criticism from a number of participants in the World Economic Forum in Davos, who had already completely buried Bitcoin, or the withdrawal of Bitcoin-ETF from the Chicago CBOE exchange, could affect it . The pair BTC/USD could not get out of the corridor of $3,570-3,800. Attempts to break it both up or down ended in failure. 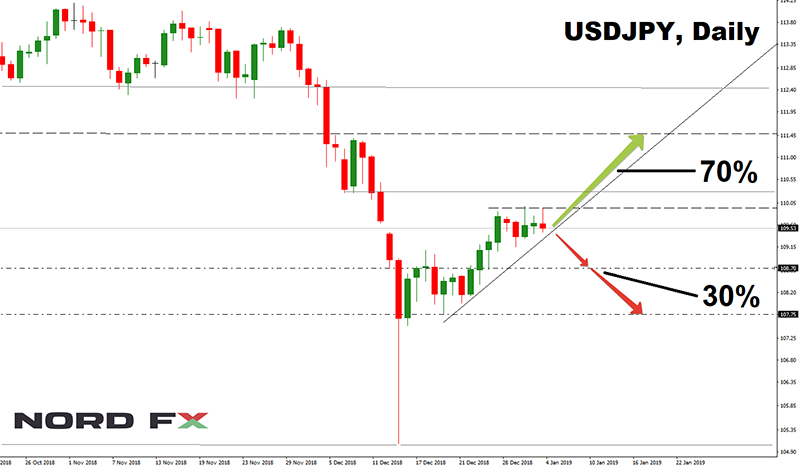 In the first case, the pair managed to reach the height of 3.870, in the second - go down to the horizon of 3.460, but eventually returned to the center of the corridor in the region of $3,580-3,675. EUR/USD. The rates of dollar pairs in the near future will certainly be affected by news of trade negotiations with China, which will be held on January 30-31 in Washington, and which have quite a lot of chances for success. In addition, statistics for the US labor market will appear on February 1. However, Trump's economic adviser Larry Cudlow has already “leaked” the information that indicators such as NFP will increase greatly, given a very small number of applications for unemployment benefits. In addition, on Thursday, January 31, Eurozone GDP data will be published, which are likely to be disappointing. All this can strengthen the US currency, which is agreed by 60% of experts, expecting the EUR/USD pair to fall, first to the lower border of the medium-term channel 1.1300, and then even lower, to support 1.1270 and 1.1215. On the other hand, as has already been said, the market has intensified expectations that the tightening of US monetary policy will be phased out. That is why on January 30, special attention should be paid not so much to the Fed's decision on the interest rate (this time it is likely to remain at 2.5%), but rather to the comments of the Fed management on the plans for 2019. And if the information on the number of upcoming rate increases will disappoint investors, we can expect a decline in the dollar, which could turn into a long-term trend. In this case, according to 40% of analysts, the EUR/USD in the near future can break through the upper limit of the channel 1.1500 and reach the level of 1.1580. GBP/USD. So, on Tuesday, January 29, Prime Minister Theresa May should announce her alternate plan for leaving the EU in the British Parliament. Some versions of this have already been mentioned in the first part of this forecast. The Labor opposition cannot decide what to do, and this reduces the likelihood of a second referendum or re-election. And the Telegraph is discussing as much as five amendments, which can be put to a vote. USD/JPY. Unlike the British Parliament, there are no surprises to be expected from the Bank of Japan’s monetary policy committee meeting on January 28. The rate of the pair may be much stronger affect ed by the information from the United States. This and the information regarding the increase in interest rates on the dollar, and the success or failure in the US-China negotiations January 30-31. If both sides come to a consensus, and it is quite likely, since Trump is in great need, the American stock market will go up. In this case, the rate may rise above 110 yen for 1 dollar. 70% of analysts, supported by graphical analysis on D1, indicate a strong level of 2017–18 in the zone 111.55 as the main target. An alternative point of view is held by 30% of experts and 15% of oscillators on D1, which give signals that the pair is overbought. In the case of its downward movement, supports are located at horizons 109.15,108.70 and 107.75. Cryptocurrencies. The sluggish reaction to the news, which a year ago would have caused fluctuations in quotations in the tens or even hundreds of percent, suggests that the digital currency market is increasingly beginning to resemble Forex. This is facilitated not only by the “water tub”, which has cooled the heat of the most ardent crypto fans, but also by the increased attention from regulators. This time, the Bank of England has attended for the protection of investors, who gathered to classify cryptocurrencies, having divided them into three categories and subordinating to the current legislation. We think that in the near future we should not expect the arrival of large institutional investors, which their smaller colleagues so much hoped for. The “whales” do not have any goals to earn quick profits, and they will wait until the market situation is completely clear, and the risks from such speculations become the lowest. And such an expectation can last for years and even decades. In the meantime, as already mentioned, the major coins are in a side trend. However, it is impossible not to notice the persistent pressure from the bears. For example, the Pivot line, around which the BTC/USD has fluctuated over the last two weeks, has dropped by 20 points, the ripple (XRP/USD) has fallen by about 5%, and the Ethereum (ETH/USD) - by 8%. Of course, it is a trifle for crypto pairs, but, perhaps, it is an indicator of the direction of the coming breakthrough. The overwhelming majority (70%) of experts believe that bitcoin will finally yield to such pressure and will decrease first to the 2018 lows in the $3,200-3,250 zone, and then rush to support at $2,400. 10% of analysts have voted for the continuation of the side trend, and 20% are hoping for the pair to grow and return to the $3,850-4,215 zone. Notice: These materials should not be deemed a recommendation for investment or guidance for working on financial markets: they are for informative purposes only. Trading on financial markets is risky and can lead to a loss of money deposited.